The Fliers for the First International Conference of School as Learning Community are READY! ・A presenter (or a group of presenters) will have 20 minutes for the presentation and Qs &As. ・A presenter may use the powerpoint. ・When a presenter use the powerpoint, he/she has to bring his/her own PC with the PPT data. ・A presenter may hand out the paper material. ・When a presenter hand out the paper material, he/she has to make copies in advance by him/herself. The recommended number of copies is 40. 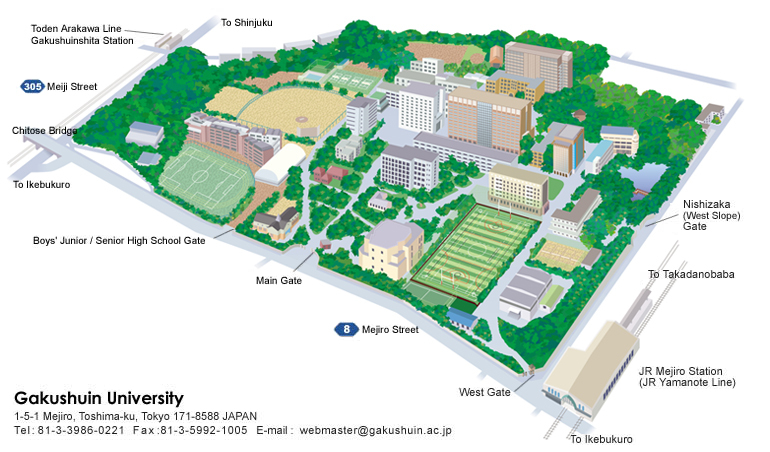 In order to get the information about the access to venue, the Gakushuin University, click here. When you like to check the timetable, click here. You need not to pay any fee of application or registration. But if you attend the reception party or/and school visit, you must pay the following charges at registration. We do not afford any support for accommodation or transit from the airport. 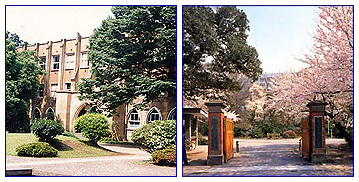 The Gakushuin University is located at a very convenient site, so you can easily find out a suitable hotel and an available transit. The conference starts at 10 a.m. on March 8 and closes at 5 p.m. on March 9. The school visit takes a whole day from 8 a.m. to 5 p.m. on March 10. The conference will be held in English. However, the opening forum on March 8 is managed in English and Japanese by assistance of an impromptu translator. The Fliers for the First International Conference of School as Learning Community in both English and japanese are ready. Please download them freely. 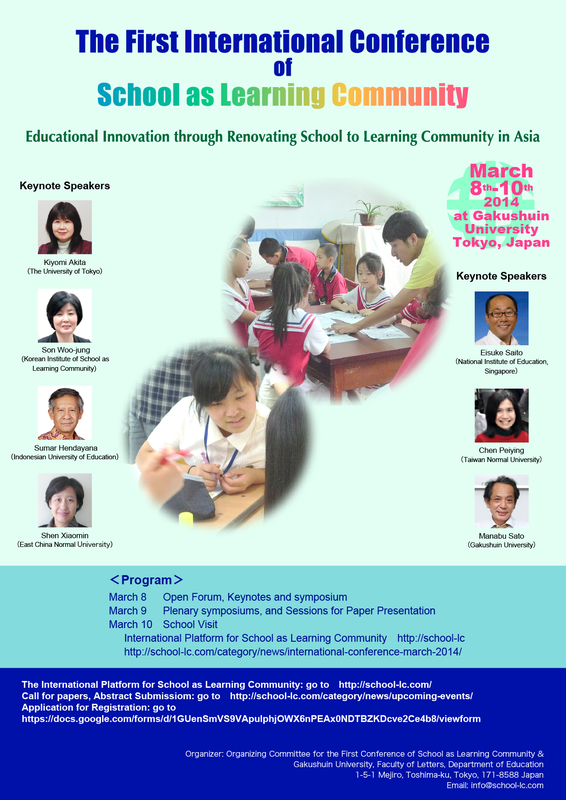 It is with great pleasure that we invite you to attend the First International Conference for School as Learning Community 2014 which will be held at the Gakushuin University in Tokyo from March 8 to 10, 2014. The theme of the conference is “Educational Innovation through Renovating Schools to Learning Community in Asia”, as we know school as learning community has drastically impacted on educational reform in all of the Asian countries and we, people who are concerned about human right of education for all , are keen to know what this means to democratization of schooling. It is also our firm belief that practical research which integrates theory and practice in the reflective practice has been elaborated among the colleagues of this movement. Every country in the process of such reforms can learn valuable lessons from the experiences, knowledge, and insights gained from others. In this conference, we invited the leading professors from China, Korea, Taiwan, Japan, Singapore, Indonesia and Vietnam, as keynote and plenary speakers. The first International Conference for School as Learning Community 2014 aims to provide a platform for education researchers and policy-makers throughout the Asian countries. You are cordially invited to take part in this exciting international event, and to share your innovations, experiences, cutting-edge findings, best practices and visions of education reforms. Kiyomi Akita is a Professor, Vice Dean at Graduate School of Education, The University of Tokyo. Her major is educational psychology, especially focuses on teachers’ professional development and on discourse analysis in the classroom. 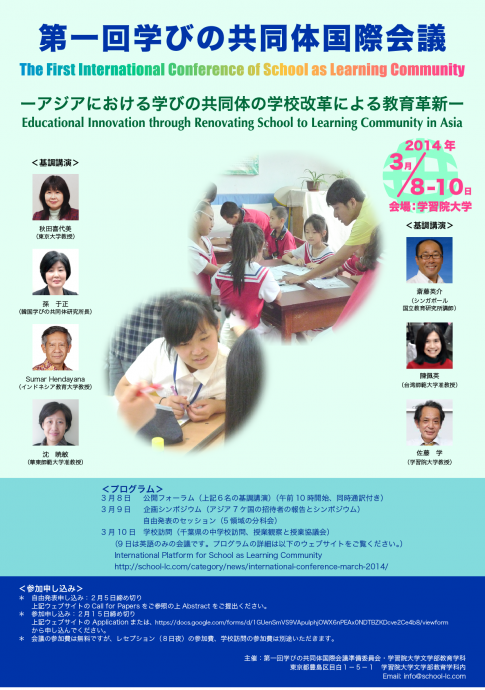 She has engaged in lesson studies of many schools as supervisor for more than twenty years. She is a member of Science Council of Japan and a council member of National Institute of Educational Policy Research in Japan. She is a vice president of World Association of Lesson Studies(WALS). Her recent book titles are ‘Psychology of Learning; Designing for Lessons’(Sayusha,2012), “ From the space of teaching to place of learning together’(Toyokan,2012) . Manabu Sato is a professor of Gakushuin University, a professor emeritus of The University of Tokyo, and a director of the Humanities and Social Sciences Division of Japan Council of Sciences. He was the past president of the Japanese Educational Research Association. He published more than 20 books, about 100 editorial books and nearly 200 academic papers. Many of his books and papers have been translated into English, French, German, Spanish, Chinese, Taiwanese, Korean and Indonesian. Professor Sato’s multiple contributions have been recognized in the world. For instance, he was elected to be a member of National Academy of Education in the United States, and in 2009, he was appointed the Inaugural Fellow of American Educational Research Association. In addition, he was a winner of the Excellent Award of Asian Publishing Award 2012. Son Woo-jung is a Director of the Korean Institute of Learning Community. She got Ph.D. at the University of Tokyo. She was a professor at Pusan National University from 2003 to 2006, the Policy Adviser to the Minister, Republic of Korea National Assembly from 2006 to 2008, and she was a School Innovation Consultant of Seoul Metropolitan Office of Education from 2010 to 2011. .After the above careers, she established the Korean Institute of Learning Community and is actively involved in it. She published a book entitled “Learning Community” by Hainan Press in 2012. Sumar Hendayana is Head of Center for Innovation in Education, Institute of Research and Community Services, Indonesia University of Education. He has been working closely with teachers in promoting a strategy of teachers’ learning through school-university partnership since 2001. In 2006, he worked collaboratively with JICA (Japan International cooperation Agency) to establish piloting project of lesson study at Sumedang district. He expanded lesson study project to other 3 districts (Karawang district, Surabaya City, and Pasuruan district) under support of Sampoerna Foundation from 2008 to 2010. Under support of Ministry of National Education and Culture and West Java Provincial Office of Education, He was a leader in dissemination of lesson study in West Java Province. Currently, He is a team leader for dissemination of school-based lesson study in Jambi Province under support of Government of Jambi Province. He has joined lesson study networks, such as Asia-Africa Dialogue Network, APEID. He is a council member of WALS (World Association of Lesson Study). Shen Xiaomin is an associate professor of Institute of Curriculum and Instruction in East China Normal University. Research Fields: Social Studies Education, Citizenship Education, Learning Science. She participated in the drafting of National Curriculum Standards for History and Social Studies(2001), and Morality and Society(2011). Since 2011, Dr. Shen has been working with some schools in Shanghai together on an action research of building learning community. Eisuke Saito joined in Curriculum, Teaching and Learning Academic Group (CTL) in December 2008. Beforehand, Eisuke used to work as an educational consultant in developing Asian countries, such as Bangladesh, Indonesia and Vietnam, for almost a decade. Eisuke worked for promoting lesson study in Indonesia and Vietnam since 2004 and 2006, respectively, and still has been working with teachers in Vietnam to further promote school reform based on lesson study. His research interest covers lesson study as mentioned above, comparative education, action research, professional development and learning of teachers. Peiying Chen is an Associate Professor in the Department of Education and Graduate Institute of Policy and Administration at National Taiwan Normal University (NTNU). She specialises in research on school improvement and leadership, professional learning communities, teacher professional development, and gender and education. She has published numerous chapters and journal articles in international journals including School Effectiveness and School Improvement, Educational Review, School Leadership and Management. She is currently leading the Taiwanese comprehensive school reform program. She is the main developer of nationwide PLC workshops and networked learning communities in Taipei. Ou Yung-Sheng got his Master’s Degree from Tokyo University, Japan, and Ph.D. from National Taiwan Normal University. He is currently a chair professor at Taiwan ShoFu University and the dean of the College of Humanities and Education. He was the director of the Institute of Taiwanese Elementary School Teachers In-service, president of National Taipei University of Education, R.O.C. president of the Association of Curriculum and Instruction, president of the Association of Normal Education. He currently serves as the chair professors at Nanking Normal University, Northeast University, Southwest University and Harbin University in China, and also Macau University and Hong Kong University. He published many books including New Horizons on Curriculum Study, Methodology of Curriculum Study, Curriculum Theory and Praxis, Restructuring of Curriculum Paradigms, Curriculum and Instruction of Social Studies, Journey of Textbooks, Teachers’ Professional Development, Qualitative Research in Education. Li-hua Chen is Professor and Chair at Graduate Institute of Curriculum and Instruction in Tamkang University, Taiwan. She has been serving as chairperson in various official committees, such as the National Committee for the Verification of Primary Social Studies Textbooks, the National Committee for the Development of Social Studies Media, and the Elementary School Alliance of School as Learning Community in Taipei City. Her academic expertise focuses on social studies education, global education, multicultural education, curriculum development and textbook design. Her most recent research topic focuses on the curriculum construction and implementation of “New Taiwan Image” in the global context. Tatang Suratno is a lecturer and researcher at Indonesia University of Education (Universitas Pendidikan Indonesia). He has directed and conducted nation-wide Lesson Study and Master Teacher project, as well as other innovative projects especially related to school reforms and practitioner inquiry. His research interest includes the area of teacher education and development, socio-cultural-historical aspects of teaching, learning and schooling, and policy-practice nexus in education. He has presented and published research findings at conferences and academic publications. Having worked as a researchers on education in the Research Centre for Pedagogy at NIES, Ministry of Education and Training (MOET) Vietnam for 25 years (1979-2004). Her main focus was on primary teaching and learning. Her first doctoral thesis addressed the topic “The relationships between family and teacher for Year1-2 students’ achievements“. She also gained the second Ph.D. degree in Education and International Development at Institute of Education (IOE), University of London (UOL) on the topic “Improving teaching and learning for health in multigrade schools in Vietnam“. She completed the Bachelor of teaching Physics at Hanoi II University of Education. For last 10 years she has worked as a senior researcher for Hanoi National University of Education (HNUE) and taken the responsibility for research projects on the research-based teacher education model that provides teachers for educational innovation after 2015 in Vietnam. Yoshiko Kitada is an associate professor at the Integrated Center for Clinical and Educational Practice attached to the Faculty of Education, Saitama University, Japan. She has been actively involved in a number of school reforms based on the philosophy of “learning community.” Her research focuses on the effects of “learning community” on both students and teachers; how students learn in collaborative group work, how teachers develop their professional expertise, and how principal’s leadership affects school reform. Masatsugu Murase is the director of Azabu Institute of Education, Tokyo, Japan. He also is currently assigned as an advisor for the board of education of Nago City, Okinawa in Japan. Afterwards he worked as a research assistant at The University of Tokyo then he served as an associate professor at Shinshu University. His areas of focus are collaborative learning and teacher education. He has deepened these research topics theoretically and practically working with a number of school teachers in Japan and Asian countries. Nguyen Van Khoi is currently an officer of Bac Giang City Bureau of Education and Training, Bac Giang Province, Vietnam. Beforehand, he worked as a teacher-in-charge for the respective provincial level department. Khoi’s first experienced with Lesson Study for Learning Community (LSLC) in 2006. Since then, he has been an enthusiastic promoter of LSLC, serving as a part-time consultant for Plan Vietnam and the Ministry of Education and Training. He has published articles in the national Journal of Education and Society and also co-authored a LSLC guideline in Vietnamese. John Yeo is currently a Teaching Fellow at the National Institute of Education (Singapore). He teaches the Master’s programme for Curriculum and Teaching in courses such as curriculum design, teachers’ professional learning, authentic assessment as well as conduct professional development workshops. As a coauthor of the new book “Sustainable School Reform through Lesson Study for Learning Community”, he engages administrators and teacher leaders with dialogue on educational issues such as curriculum innovation. In 2013, he was nominated for the Excellence in Teaching, Nanyang Education Award. Lee Kwangho is a co-founder and a teacher of the Ewoo School in Korea. He is the head of the Research Institute of Collaborative Education, and a member of the Innovative Shool Committee of Gyeonggi Provincial Office of Education. See →　‘Call for Papers’ in the “Upcoming Events Corner” on a Website of the International Platform for School as Learning Community. The conference is managed just with English. The opening forum of keynote speeches on March 8 is arranged with English and Japanese by assistant of an impromptu translator. The conference starts from at 10 a.m. on March 8 and closes at 5 p.m. on March 9. The school visit takes a whole day from at 8 a.m. to at 5 p.m. on March 10. See →　‘Application’ in the “Upcoming Events Corner” on a Website of the International Platform for School as Learning Community.